Howard was away all week, which worked out well because anything savory with fruit sauce wasn’t going to go over with him anyway. In his absence, a couple of my friends came over to watch a movie, and I made this week’s French Fridays with Dorie recipe to share with them for dinner first. I could not find lychees. I looked really hard, but was unsuccessful. I was really hoping I could find them because I have a story about lychees that I wanted to share. I was thinking that if I left out the lychees, I couldn’t tell you the story. However, the more I thought it over, I decided I’d tell the story anyway. Many years ago, maybe twenty, I worked for a man named Tudor who was from Romania. A real mad scientist type. Our work was in the software field, but he was a physicist by training, and quite brilliant. At the time, my job involved a lot of travel, mostly to Michigan. To be fair, I don’t know what it’s like now, but twenty years ago in the Detroit area, most of the restaurant food on offer was horribly dull. I did a systematic study of side salads, and the uniform result was a wedge of iceberg lettuce topped with one green pepper ring, one wedge of an ice-cold tomato and maybe one slice of cucumber, with dressing on the side. One of these trips, Tudor was there too. After a long day at the office, we had dinner at a Chinese restaurant near the hotel. I’ll admit that the meal itself was not memorable. As we were finishing up, Tudor starting talking about leeches. He was nostalgically recalling eating them and telling me how delicious they were. He was going on and on. I was confused. I had a hard time imagining that anyone would be excited about eating leeches, especially if they knew what they were. He couldn’t believe my disbelief and that I’d never tried them before. In retrospect, it was a comical exchange. All was revealed when, along with the fortune cookies, the waiter brought a small bowl of fruit that I didn’t recognize. Tudor was thrilled because they had served us none other than his beloved leeches. It turns out that, he had been talking about lychees all along. I opted to make a pork tenderloin instead of a pork loin. I know that loin and tenderloin are not the same cut of meat and that the cooking technique best for each cut is quite different. Slightly fattier pork loin can handle a slow braise while the lean tenderloin shines with a quick and hot roast. So I changed things up a bit for, hopefully, a similar result. Rather than braising the pork loin in the sauce, I roasted the pork tenderloin in a hot oven while I made the sauce on the stovetop. The sauce was a tangy sweet-and-sour sauce. The vinegar and lime juice gave it the tang while the honey added sweet and the soy sauce and white wine worked to blend it all together. As I said, I couldn’t find lychees. I only vaguely remember what they were like on that one occasion when I’d had them before. I substituted a can of sliced water chestnuts and a diced Asian pear, plus the called-for sliced mango . I let the sauce simmer while the pork finished cooking. 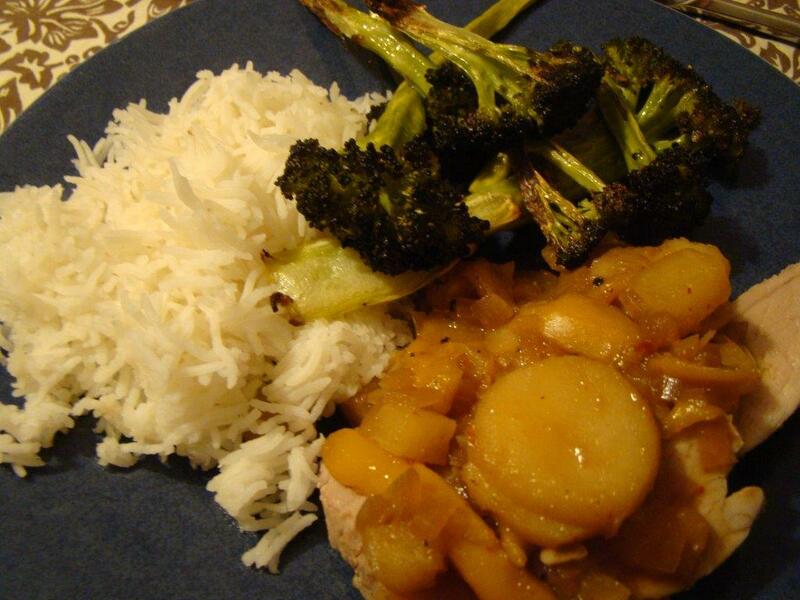 I served slices of pork topped with the sauce, accompanied by basmati rice and roasted broccoli. One of my friends put sauce on the rice too. Reviews were thumbs up all around. The leftovers made a nice rice bowl: leftover rice topped with pork and sauce and garnished with a few stalks for the roasted broccoli. If you’d like to know whether the other Doristas liked the pork, check out their links here. The recipe is over on the WBUR website (my local NPR station). Of course, it’s also in Dorie Greenspan’s book Around My French Table. Posted on 17 April 2015, in French Fridays with Dorie and tagged French Fridays with Dorie, mango, pork. Bookmark the permalink. 19 Comments. Your substitutions sound delicious and I had to laugh at the “leeches” story. Actually in French the word sounds an awful lot like “leeches” too! Hi Betsy, what a fun story, and looks like you had a fun evening along with a very nice dinner! Of course he liked blood sucking leeches… he’s Romanian. Tudor probably was a Transylvanian vampire… very funny word mix up. 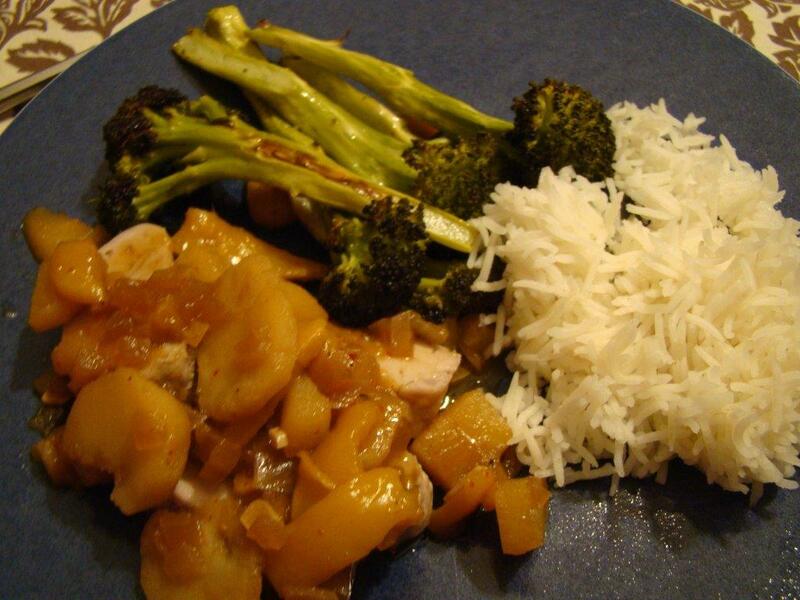 But back to the real meal, I just used Asian Pears in a different dish and I think they would be a terrific substitute, actually better than the Lychees. I was wondering what you would do this week for Howard! A perfect time for him to be away! Love the story of Mr. Tudor and his leeches…I think I would have gagged! My son is in Ecuador this week, and sent me a photo of a grill full of food for their feast…it included…grubs! That also made me gag! Your roast looks luscious…glad you enjoyed it! Have a great weekend, Betsy! My husband had a similar misunderstanding yesterday. He was very relieved to realize his mistake. Too funny! I don’t even like to look at leeches—wonder if anyone does eat them?? Glad you and your company enjoyed this pork. Bill did, too—I was a bit surprised! Great story Betsy. This was good with the fruit and I paired it with rice also. Leeches. Lychees. Let’s call the whole thing off! Thank you for telling us that tale, Betsy. It was appropriate to the recipe whether you could find them or not. And, I suspect, with the weather you’ve had in your area this winter, there isn’t a leech in sight either. I used a tenderloin also and, yes, cooked it for a less amount of time but did do the braise. I thought it needed the flavoring. This was a movie week for you and I suspect you got a few books read also. It’s nice to have a small break but know you’ll be happy to have Howard home safely. That’s a great story, Betsy! You must have been relieved to find out that the restaurant wasn’t going to bring out a bowl of leeches. Your variation sounds delicious and I love the idea of having the leftovers in a rice bowl. This one was a hit for us, even though I had to go 20 kilometres to get the lychees. LOL – I am so glad that he doesn’t really eat leeches (ew!). I loved this dish. Lychees are usually fairly easy to get here because they are the staple dessert with icecream in Chinese restaurants, but I had to go to 2 different supermarkets before getting them. It was worth it – a very nice man at the city supermarket where I bought them pointed out the canned fruit – I must have looked lost. What a lovely dinner you made for your friends! I think your additions sound great too. And so happy that you included the lychees in your story if not in your dish! Love it!! My mom had certain dishes that we would always make when my dad was traveling for business – why not? It’s a win-win. So happy that you enjoyed your week! Hahaha, leeches. I’m glad you told the story! I also like how many people made this with pork tenderloin, especially because I prefer tenderloin to loin! Yours looks great and I like how you adapted it, too. Yum, yum, yum! Great story, English as a second language. We enjoyed this pork dish and would make again. I laughed at your story about cottage cheese. When I watch Food Network, Chris Santos from Chopped also hates cottage cheese. I would also like to thank you for the recipe for the duck fat potatoes. I finally got around to making them tonight. Delicious! Betsy, I read in one of your comments that Howard went to Germany – you should have let me know, dear friend, I would have made sure to send him a gift for you to bring back home (I would have loved to make/bake something for you – that way, it would have been reasonably fresh)…maybe he will visit agian – whereabouts did he go/stay? Have a lovely week, say “Hi” to Howard from me and tell him to give me a call next time he is in Germany! Funny, as I made this I was thinking about Howard and his dislike of fruit in savory dishes. I’m glad to hear he avoided this one! I personally think fruit and pork work well together and so enjoyed this dish. It sounds like it works well with tenderloin too.